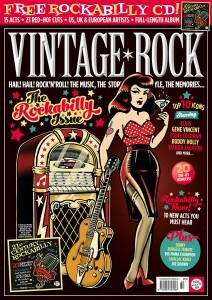 It’s a bumper issue of Vintage Rock magazine this autumn, as the packed issue comes with a totally free 23-track CD of some of the hottest rockabilly acts around. If you thought real rockabilly died back in the 50s, think again – these guys and gals are tearing it up with a vigour that would excite Sam Phillips back in the days of Sun Studios. Just some of the UK, Europe and the USA artists on your free CD are The Bullets, Delta 88, Bob Butfoy, Little Lesley & The Bloodshots, Rusti Steel and Jack Rabbit Slim. Crank it up! Inside Vintage Rock’s pages, we look at rockabilly history in detail, profiling the unique appeal and crucial cuts of the Top 10 heroes of all time, including Elvis, Gene Vincent, Eddie Cochran, Buddy Holly and more. There’s some amazing one-hit wonders that you should seek out for your rock’n’roll collection, too. We look at the 1970s rockabilly revival, when the UK did more for the scene than even the USA, and we keep you to date with out tips on the hottest rockabilly acts out there right now in 2017. There’s much more besides: we take time to pay tribute to the late Sonny Burgess, another Sun legend, with a previously unpublished interview; we look at the strange career of Hound Dog pioneer Big Mama Thornton, and Vince Eager’s My Life In Rock & Roll column sheds new light on the tragic death of Eddie Cochran, including never-before-seen pictures from the following days.